There are some holidays that are just unmistakable, even if you aren’t near a calendar to check the date. When the leaves change and weather cools, it’s almost time for Thanksgiving. When the lights go up and the cheerful music rings out, Santa Claus in on the way. There’s also another unmistakable holiday, more obscure than the others, that is almost always associated with rapid percussion and the unique, melodious sound of bagpipes: Veterans Day. The Disabled American Veterans, Black Mountain Chapter 12, hosted its annual Veterans Day ceremony at the Nevada State Veterans Home on Nov. 11 in front of a few hundred admirable veterans, families and friends. It was the 11th hour of the 11th day of the 11th month in 1918 when Germany agreed to a ceasefire with the Allies, ultimately ending World War I. That day quickly became known as Armistice Day, which became a federal holiday in 1938. In 1954, after the end of World War II, the Act of 1938 was amended, giving us the holiday we recognize today as Veterans Day so that Americans who served in all wars could be honored, according to the Department of Veterans Affairs. 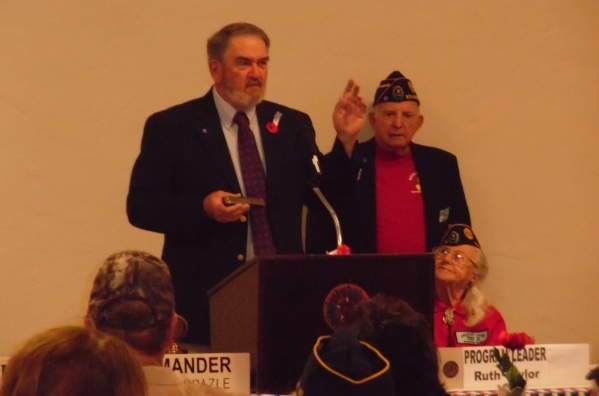 At the local ceremony, veterans from all branches and wars from World War II to the current war on terror were present and honored with speeches, songs and praise. 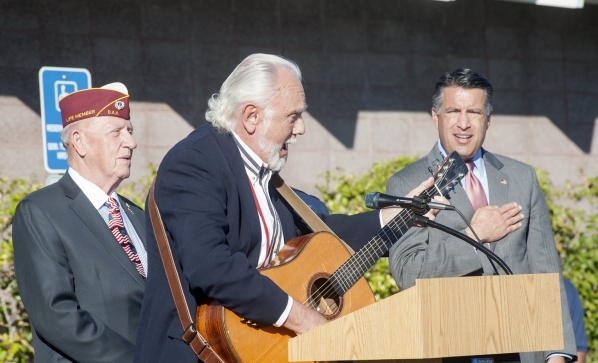 The governor said the state has set aside $14 million for new veterans home in Northern Nevada. He is hopeful they will break ground next year. Lt. Col. Cameron Dadgar, U.S. Air Force, also spoke. Dadgar, who has 20 years of service, is the commander of the 549th Combat Training Squadron and an F-16 instructor at Nellis Air Force Base. “Veterans Day is fantastic, but it ends up being very private, when I agree it should be a very public-type of thanks,” said Dadgar. Dadgar expressed his interest in veterans’ sacrifices for the common good, saying America’s veterans are still sacrificing today. He spoke about issues of mental health, such as post-traumatic stress disorder and depression, as well as issues of financial struggle and sleeping disorders. Sandoval said the issues veterans face haven’t gone unnoticed in the eyes of Nevada, and that the state is working diligently to find solutions. Sandoval said the piece of legislation will create and expand resources for military families, veterans and troops returning home through advanced education, employment and health care services. Prior to the afternoon ceremony, Sandoval said he helped break ground for a new one-of-a-kind veterans memorial in Las Vegas that will have larger-than-life statues from every war — from the Revolutionary War to the current conflict. American Legion Post 31 in Boulder City had its ceremony of thankfulness on Nov. 11 as well, at the 11th hour of the 11th day of the 11th month. The post likes to keep to tradition, according to Second Vice Commander Dawn Walker. Retired U.S. Air Force Maj. Doug Morse was the keynote speaker at the ceremony, which was attended by about 60 people, including the Patriotic Singers, a Boulder City children’s choir that also performed. Morse is a 20-year Air Force veteran, with more than 4,000 flight hours. The nine-year Las Vegas resident spent his military career as a pilot in various air-frames, starting with the B-52 in 1988. He went on to fly the B-1 and ultimately the U-2, where he was able to assist in the rescue of seven prisoners of war in Iraq. “I wanted to bring in the mentorship, teaching and instruction (of the military),” Morse said of his speech. “I’m just amazed at this. It brings the message of importance in supporting and caring for our vets. Contact reporter Randy Faehnrich at rfaehnrich@bouldercityreview.com or at 702-586-9401. Follow him on Twitter @RandyFaehnrich.